To say that my family and I love all things pierogies would be an understatement. We first became obsessed with them while living near Pittsburgh over 3 years ago. That city has some mad love for their pierogies. I have had the idea of creating a homemade pierogi-inspired pizza mulling around in my head for over a year now. Why I hadn't made this little delicious daydream into a reality sooner is a mystery to me! I finally got the little push that I needed to make this recipe idea happen when I saw the 2015 Idaho Potato Commission Recipe Contest for this year's Food & Wine Conference. What better way to showcase Idaho potatoes than with this delicious deep dish pizza recipe? Place the prepared potatoes in a large saucepan and fill with water until the potatoes are just covered. Bring to a boil over med-high heat. Continue boiling 15-20 minutes or until fork tender. Drain the potatoes, and then place them back in the saucepan or in a mixing bowl. Mix in the milk and butter, and then use an electric mixer to beat the potatoes smooth. Mix in the salt & pepper to taste. Set aside. While the potatoes are boiling, prepare your caramelized onions. Heat the olive oil in a medium skillet until just heated. Add in the sliced onions. Cook over medium heat stirring often for about 10 minutes. During the last 5 minutes of cooking, sprinkle the onions with a little bit of salt and sugar to help quicken the caramelizing process. Onions are done when they are tender and very brown. Set aside. Roll the dough using a floured rolling pin on a floured surface into 10-12-inch circle; then place in a greased 12 inch cast iron skillet. Spread the dough out to the edges & then form a rim by pinching the edges of the dough upwards. 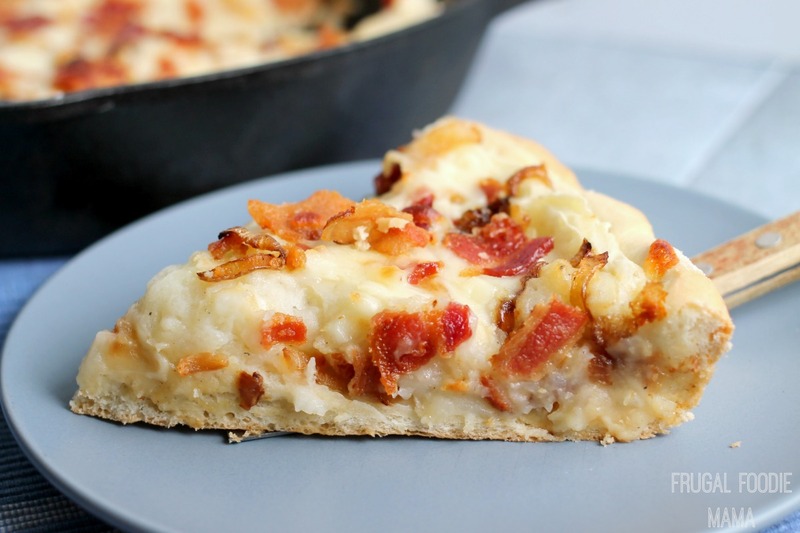 Spread the mashed potatoes evenly over the prepared pizza crust. Then top with the caramelized onions, chopped bacon, and shredded cheese. Bake at 425 for 15-20 minutes or until the crust is golden brown and the cheese is melted. Let the pizza rest at least 10 minutes before cutting. 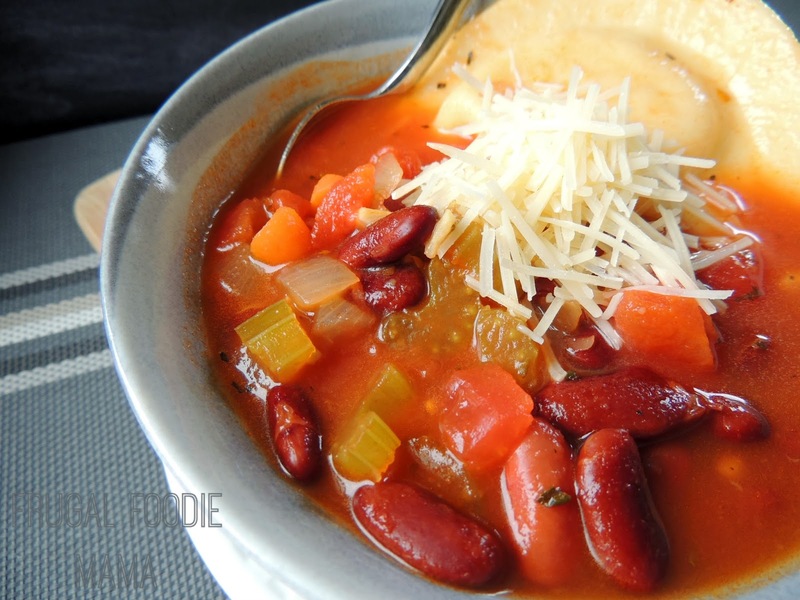 **To make this recipe even easier, you can use a store bought pizza dough or a pizza crust. You can also use reheated leftover mashed potatoes in place of the fresh homemade mashed potatoes. This recipe does require a few steps of prep, but you can always make the mashed potatoes and cook the bacon the night before. 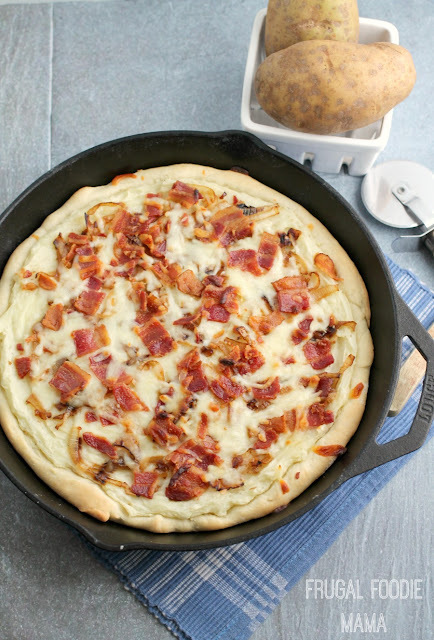 Just be sure to reheat the potatoes a little before spreading them over the pizza crust dough. The bacon should crisp right back up while the pizza bakes. 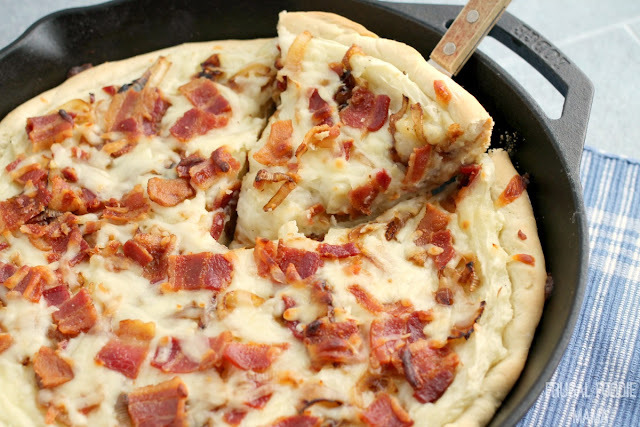 And I really do recommend baking this pizza in a 12-inch cast iron skillet if you have one. The cast iron just somehow gets the deep dish crust perfectly soft in the inside, yet has a little buttery crisp on the outside. You can certainly use a regular 12 inch pizza pan if need be, but you may not be able to obtain the same thickness and crispy softness that you can by using cast iron. I think that it goes without saying that my pierogi-loving family gave this homemade pizza recipe two thumbs up all around. 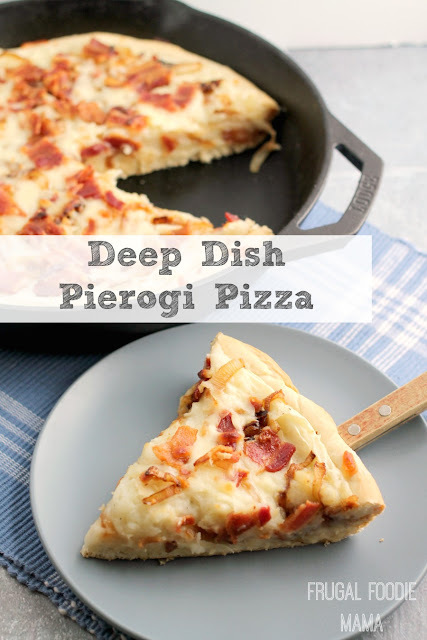 I mean, how can you go wrong when combining a homemade deep dish pizza with all the goodness of pierogies? We do recommend serving this pizza with a little sour cream on the side for dipping. 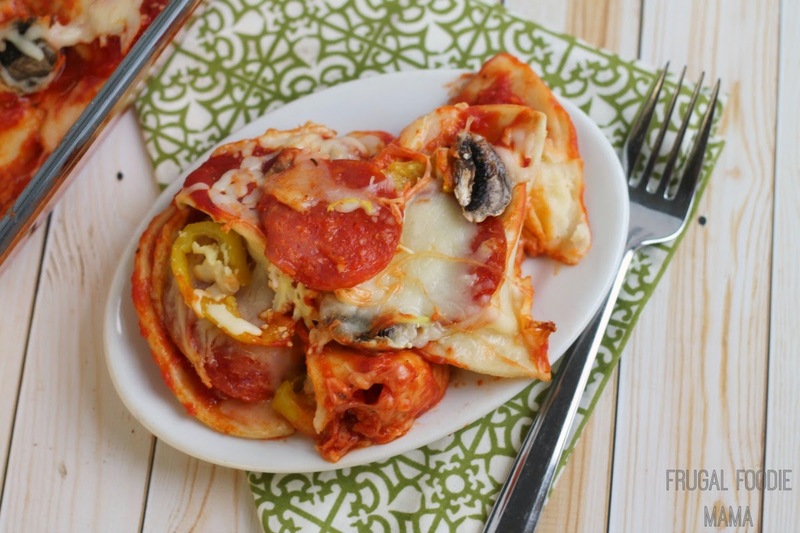 Which of your family's favorite dinners would you turn into a homemade deep dish pizza?